A barber, who has fought in a version of WWI for Tomainia, rescued a pilot in the final hours, but has been hospitalised for years, only returning to the Jewish ghetto in the capital after the country has been taken over by a dictator, who when he has failed to borrow money from a Jewish banker decides to persecute the Jewish inhabitants of the city. The barber, who is forming a relationship with a good looking launderess, is grabbed by the stormtroopers and is only saved from being strung up by the pilot who he saved. The barber and the dictator look the same, and finally the former replaces the latter and makes a rousing speech. In WWI the private survives, the dictator makes some rousing speeches ( in a German sounding fake language), he meets with another dictator, he dances with an inflatable globe, the barber interacts with the population of the ghetto who are variously threatened by stormtroopers, there are a variety of comic set pieces in the barber’s shop, some domestic interaction with the laundress, and finally what amounts to a speech to camera by the actor. A View This film has historic significance being made in 1940 and released soon after the declaration of war by the Allies against Germany, although America was not yet involved. 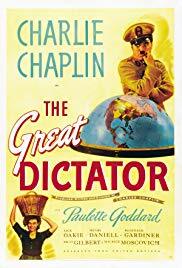 I thought it seemed pretty courageous, but as it turns out Chaplin said that had he known the extent of the Nazi atrocities he would not have made it. My wife and I watched it due to its importance, but we kept falling asleep. Honestly, while the sketches were really clever, the plot was weak and a proper conclusion is replaced by a humanitarian speech. So bear this in mind before committing to viewing it. Source of story An original screenplay – although this is disputed by some. Additional Info This film was banned in many countries, particularly those occupied by the Nazis, although Hitler is reputed to have sen it. It remained banned in Germany until 1958, in Spain until after the death of Franco in 1975 and as a complete version In Italy until 2002. Britain expressed and intention to ban it as well, had war not broken out.